I have been trying out new ways of incorporating more raw bell peppers into my diet, especially since reading up on how incredibly healthy they are. And this sandwich is my favorite new way to enjoy these crispy-sweet peppers . It’s my take on the classic BLT. Instead of bacon, I use slices of salami and bake them off in the oven. If you prefer bacon you can prepare it in the same way, in the oven without the greasy mess. 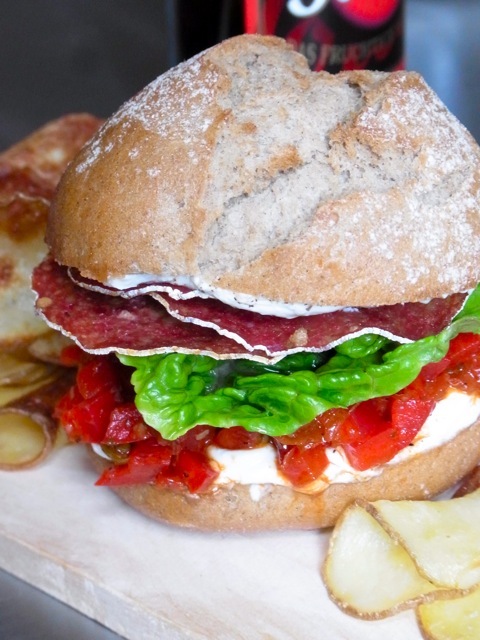 I also use sun-dried tomatoes and have added red bell peppers, which are antioxidant rich and packed with vitamin C. This sandwich is also great served without the salami or bacon. When served without the salami it’s like eating a vegetarian sloppy-joe. You can find the vegetarian version of it here. The sweetness of the bell pepper go well with intense tangy flavor of the sun-dried tomatoes and the wonderful warmth of the cayenne and paprika. Place the salami on a baking sheet lined with an oven safe wire rack or a piece of aluminum foil. If you are using foil, I find it best to crinkle the foil first, then open it and spread it along the baking sheet. This helps the salami not to stick to the foil as easily and it helps to pool the excess fat. Bake in the oven until you have your desired doneness, about 15-20 minutes. Remove from the oven and place the “bacon” slices on a clean plate lined with a paper towel. Meanwhile, make the filling for the sandwiches. To make the filling, place the red bell peppers, sun-dried tomatoes, garlic, capers, paprika, cayenne and salt into a medium-sized mixing bowl. Using a clean spoon combine the ingredients. Check for seasonings, adding more if necessary, then assemble the sandwiches. To assemble the sandwiches start by toasting the bread in a toaster. Then, spread each half with ½ tablespoon of mayonnaise. Then, layer the bottom bun with ¼ of the red pepper mixture and top with some of the lettuce, followed by two slices of bacon, cutting them to fit the bun as necessary. Top each with the top half of the bun. Enjoy immediately.